It's about time to post the results of our great Craigslist discovery that still has me reeling. I was holding off until I could post some better photos with the new camera but these will give you an idea for now. Since I'm usually running errands or tackling a project on the weekends I have about 5 minutes during lunch to snap some pics, and these rainy days haven't made for great lighting. At any rate, it's home. Jasper Sofa from Room & Board + bulldog tail/paw. 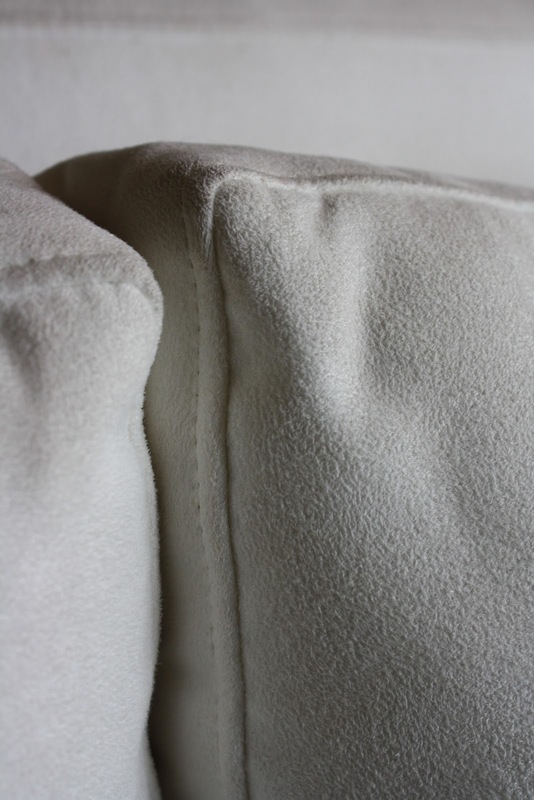 Here's a close-up of the white microsuede. It's white, so it shows dirt easily (umm, duh) but thankfully microsuede is renowned for clean-ability. 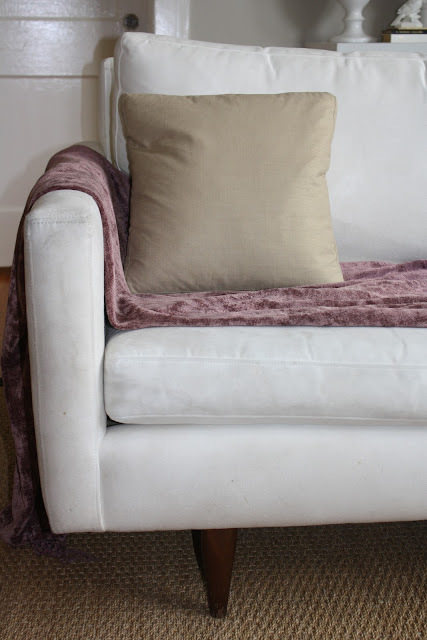 In fact, I heard David Bromstad refer to it as "God's gift to stains" (or something like that) when he bestowed a white microsuede sofa to a client on Colorsplash. Now I'm on the hunt for pillows. But then again, I think I'm always on the hunt for pillows. I may even be a pillow hoarder. What do you think? 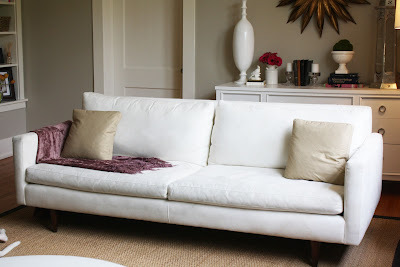 Anyone have experience with cleaning a white sofa clean (or, heck, any color)? Do you think we should still consider getting the slipcover? Is that YOUR living room? It looks like a magazine layout - kudos! Try "shout"-ing microsuede stains out. Works for me! Thanks, Anon. I haven't thought of using Shout, but the wipes should be super-easy for little spots. Great tip! Thanks again. Just curious - did the Shout wipes work? We have a Jasper sofa with microfiber and we need to get a little stain out. Thanks in advance! Hi there! I haven't tried the Shout Wipes yet, but I hope to eventually. I use Stanley Steemer's Spot Remover and it works extremely well. I use it all over the sofa to remove the grungies from dogs and whatnot, and to spot-treat stains (I've even removed chocolate and red wine spots if that gives you an idea of why I love this stuff so much). Thank goodness it's microsuede! Let me know if you try it - or if you find something else that works, okay? Thanks so much for the advice! Since our stain was pretty small (a guest had strawberry on their hand and touched the cushion), we purchased Incredible! brand cleaner from Bed, Bath and Beyond. It worked really well and took out the stain very easily. TRADhome Premiere Issue is Live!